One recent summer, Richard Starks and Miriam Murcutt traveled through Spain - from Barcelona in the north to Malaga on the southern Mediterranean coast - staying exclusively in ancient monasteries. As they quickly discovered, these are intriguing places in which to stay. They are ripe with history, art and culture (living museums); peopled by a dying breed of monks and nuns (last chance to see); rarely visited (so few tourists); and open to anyone who cares to stop by (you don't have to be religious, although it doesn't hurt if you are). They are also inexpensive (much of the time); eager for customers (most of the time); and always hospitable (in keeping with the Rule of St. Benedict). This account of the authors' journey will show you what it is like to turn your back on tourist Spain, to leave behind the hotels, pensions and up-market paradors and immerse yourself in the cowled world of Spain's many and varied ancient monasteries. This is not a guide book, but it does include enough information for you to plan a similar journey of your own. The tone is amusing, sometimes irreverent, but always respectful and entertaining. Monasteries visited: El Reial Monestir de Santa Maria de Vallbona ** El Monasterio de la Virgen de Monlora ** Monasterio de San Salvador de Leyre ** El Real Monasterio de Santo Tomas, Avila ** El Monasterio de la Purisima Concepcion y San Jose, El Toboso ** El Monasterio de la Santa Maria de las Escalonias ** Convento de la Purisima Concepcion (Santa Maria) Marchena. Richard Starks was born in England and raised there and in the United States and Scotland. He has worked as a writer, editor and publisher of newsletters and magazines in Canada, the United Kingdom, and the United States. He has written for television, and is the author of six previous books, two co-authored with Miriam Murcutt. Miriam Murcutt is a writer, editor and former marketing executive in the travel and publishing industries. Born in England, she has a M.A. degree in English Literature, and has worked in writing, editing and marketing of magazines, books and other publications in Canada, the United Kingdom, and the United States. She has co-authored two other books, both with Richard Starks. The first book the authors wrote together, Lost in Tibet is a true-life adventure set against the political and cultural background of pre-Chinese Tibet. Published in the United States in both hardback and paperback, it is now in its third printing. Foreign rights have been sold in six other countries. The book is also distributed in the United Kingdom; and the authors have recently sold an option for the film and television rights. Their second book, Along the River that Flows Uphill, is a travel book that uses the story of an Amazon journey the authors made to assess the risks that are inherent in all adventurous travel. RebeccaReads called it "wonderfully entertaining and extremely intelligent." Midwest Book Review said it was "an unforgettably vivid travelogue." And January Magazine, listing the book among its 'best of 2009 non-fiction', described it as "enjoyable and informative, much beyond the travelogue one might expect... creative non-fiction and cracking good fun." The two authors have travelled extensively throughout Europe, South and Central America, the Far East and the Himalayas. Most recently, they spent several weeks traveling in Spain - from Barcelona to Malaga - sleeping inside the walls of many of Spain's ancient monasteries. They have also walked with pilgrims along the Way of St. James across northern Spain from the Pyrenees to Santiago de Compostela, and passed one long, wine-fueled summer wandering the length of the French Alps. In addition, they have crossed Venezuela's remote Amazonas state; made a cold and windy circuit of the Torres del Paine in Patagonia; traveled by bus, boat and (reluctantly) horse through Central America; crossed the Tibetan plateau from Lhasa to Katmandu; hiked in the Everest valley; climbed a couple of Himalayan peaks and shucked clams and oysters with the Vietnamese fishermen of Mui Ne. 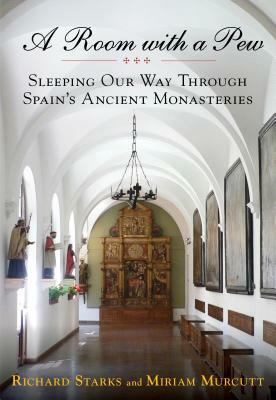 They rank their journey through Spain's ancient monasteries as one of their most rewarding experiences. The authors have a website at www.starksmurcutt.com. And they can be contacted by email at starksmurcutt@msn.com.